Humber River opened its doors in 2015 as North America's first digital hospital. Through innovative approaches, Humber is shaping the future of patient care at the bedside and in the operating room. By working with a number of high technology partners, Humber River Hospital is positioned to create efficiencies that enhance patient care. The Command Centre is what ties all of the pieces together so that decisions can be made in real time to improve communication, create efficiencies and improve the patient care experience. Humber River Hospital's general surgeons, Dr. Steven MacLellan and Dr. Jensen Tan, supported by robotic technology, performed a ventral hernia repair - a Canadian surgical first. A procedure that used to require major abdominal surgery, was performed using the da Vinci robotic system with four interactive robotic arms, equipped with precision instruments. The minimally-invasive procedure meant less pain, reduced recovery time, a shorter hospital stay and better quality of life for patients. Dr. Thomas Constantine performed one of the first supermicrosurgical procedures of its kind in Canada to relieve symptoms of lymphedema a condition that affects some after cancer surgery when lymph nodes are removed. Although not all lymphedema, can be addressed by lymphatic reconstruction surgery, the advanced surgical procedure, which is not widely available throughout the world, is available at Humber River Hospital. "Since lymphedema is much less fatal than cancer, people often feel like they have to suffer through the condition as a side-effect of cancer treatment, but I want them to understand solutions are available and we are grateful we are able to offer advanced surgeries to improve people’s quality of life,” says Dr. Constantine. We are grateful to Humber’s leadership team for its continued commitment to creating a supportive environment for our medical, nursing, and professional staff teams to provide exceptional, compassionate patient care this past year. The relentless momentum and willingness to embrace innovative approaches to care meant teams had the resources and equipment required to achieve improved patient satisfaction results. Humber’s goal of optimizing the health of our diverse community requires more than a beautiful new building and state-of-the-art technology. Through constant measurement and evaluation, we adjusted processes to support efficiencies, allowing the hospital to hire additional staff and open more beds. Our health teams received accolades and awards for excellence in teaching this past year. Academic students have recognized Humber as a desired learning site. 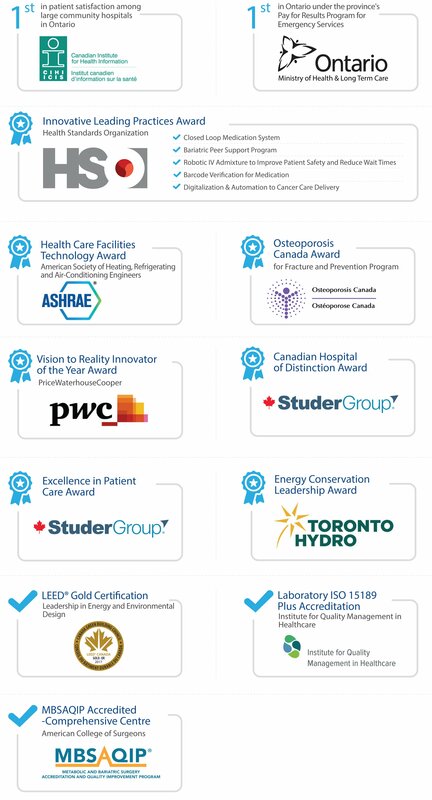 As we look back on these achievements, we are also looking forward to a bright future – one filled with possibilities and opportunities to bring the safest, most reliable care to patients and families that optimizes the health of our community. 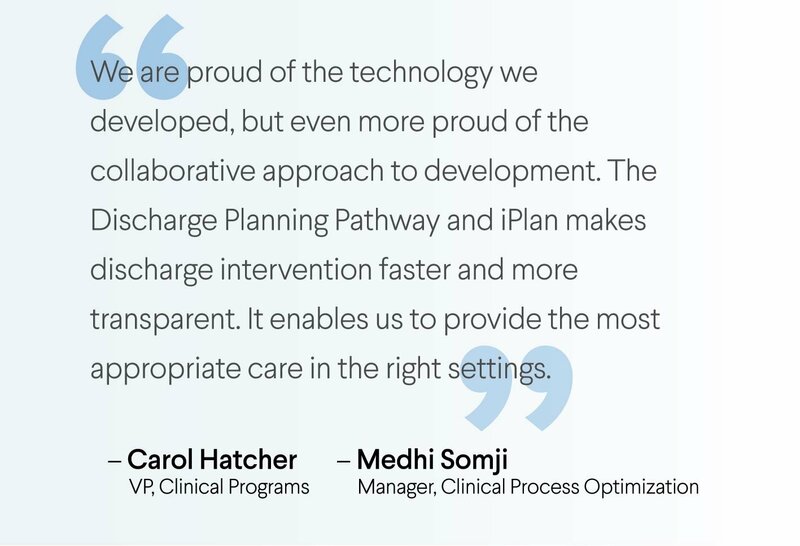 In collaboration with the Central Local Health Integration Network (LHIN) and hospitals, Humber helped create the discharge planning pathway to standardize discharge planning. Humber then created the web-based iPlan application to centralize and align patient care services with home and community needs for timely access to care. iPlan, which captures an overview of all activity, was adopted by hospitals throughout the Central LHIN. For the first time in Ontario, multiple hospital organizations came together under one roof, improving access to the right care for the right patients in the right environment to support the best possible patient outcomes. In collaboration with four other Central Local Health Integration Network hospitals, Humber led the initiative that opened 150 beds at the Reactivation Care Centre. 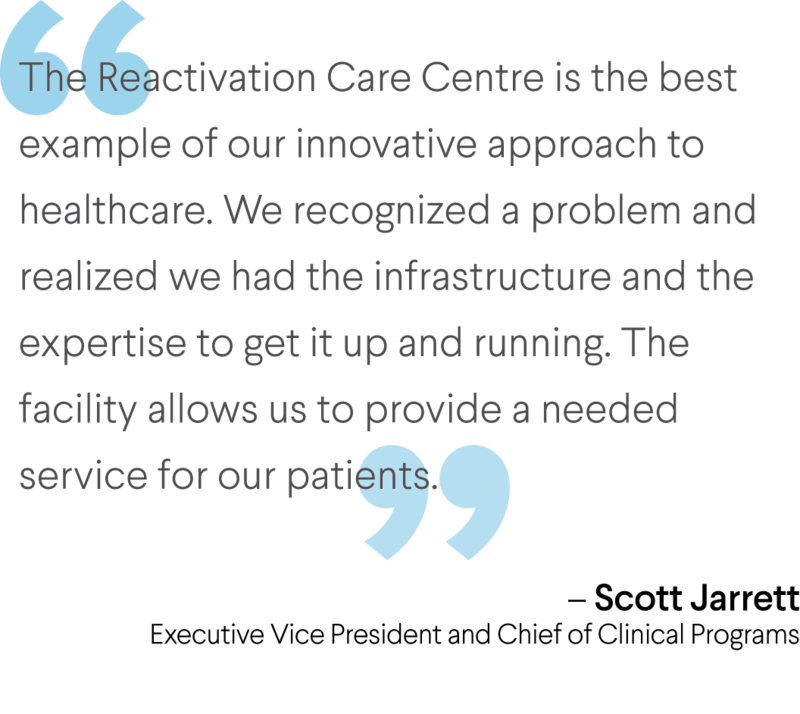 Located at Humber River Hospital's former Finch Avenue site, this innovative approach reduced wait times for care and addressed complex capacity issues that overwhelmed the health care system in recent years. Uniquely designed to support patients who no longer required acute care services while waiting for an alternate level of care, the collaborative model reduced hospital backlogs, relieved pressure and freed hospital beds for patients who required an acute level of care. Patients receiving reactivation therapies were often able to return to normal routines and independent living. This model of care captured the essence of Humber’s innovative approach to providing patients with safe, effective and patient-centred care. Humber River Hospital opened its doors to hundreds of local and international visitors, from students to health care professionals and government officials. Almost without exception, the Command Centre and Pepper, our humanoid robot, were the most popular attractions, but groups are also drawn to Humber to learn about consulting and workflow processes, such as Humber’s Robotic Intravenous Automation (RIVA) interface. As part of Humber River Hospital’s commitment to improving the health of our community, we opened the Totally Kidz Clinic. 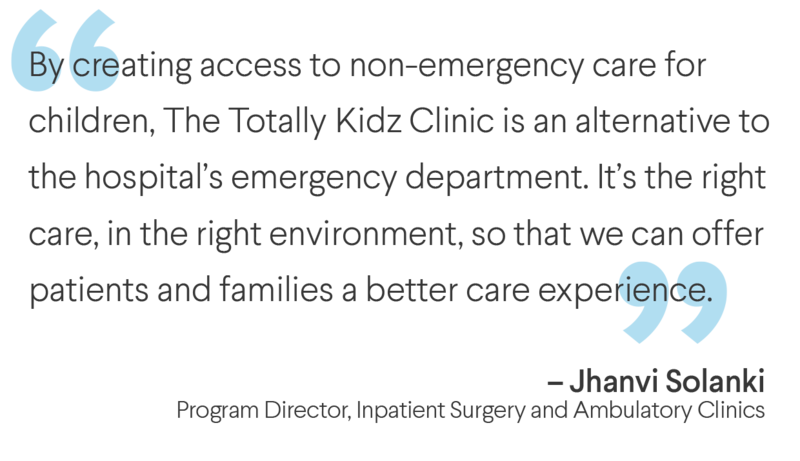 The non-emergency clinic sees children after hours, seven days a week. This patient and family-centred care solution offers a child-friendly environment that minimizes wait times and anxiety. As at March 31, 2018 this statement is an excerpt from the Audited Financial Statements prepared by BDO Canada LLP. We are governed by a 15-person Board of Directors. Our directors have an obligation to act in the best interests of the hospital and to exercise the care, diligence and skill that supports us to be a high reliability hospital. Our senior team has the unique opportunity to optimize design, incorporate technology and reinvent processes to deliver safe and effective patient-centred care. The Humber River Hospital Foundation works with our community to fund new technology and priorities that enhance patient outcomes.  Reinventing patient care is as much about the next innovation as it is about the current one.